This tutorial will walk you through the creation of a sample application that contains RadRibbonView. Before reading this tutorial you should get familiar with the visual and functional structure of the control. You can add a RadRibbonView manually in XAML as demonstrated in Example 1. At this state, the ribbonview is empty - there are not tabs, backstage or any other ribbon components. You can learn about the controls that the RadRibbonView can contain from the Features section of the documentation. The RadRibbonView helps users to quickly find the tools and options they need in order to complete a task. Tools and options are organized in logical groups that are collected together under specific tabs. The ribbon tabs allows you to categorize the commands to be displayed to the users. The class that represents the ribbon tab is the RadRibbonTab. For more information about the RadRibbonTab, check out the Ribbon Tab help article in the Ribbon Controls section. Also, keep in mind that you can use contextual tabs. You can read more about this in the Contextual Tabs topic. The tabs can be added in the Items collection of RadRibbonView. The RadRibbonTab class exposes a Header property that is used to define the content of its header. Example 2 and Example 3 demonstrate how to do this in XAML and code-behind. RadRibbonTab is a HeaderedItemsControl, which means that it can contain a collection of items. The children of the ribbon tab should be objects of type RadRibbonGroup. They expose a Header property that is used to define the content of their header. The Items collection of RadRibbonTab can contain any UIElement. However, if you do not wrap it manually into a RadRibbonGroup control, the ribbonview will do it automatically. You can find more information about RadRibbonGroup in the Ribbon Group help article. RadRibbonGroup is also a HeaderedItemsControl and it can have child elements on its own. One of the most important features of RadRibbonView is the dynamic layout resizing. It refers to the RadRibbonView's ability to optimize its layout depending on how much space is available. This process can't be automated; however, the RadRibbonView's API gives you the ability to specify how you would like the resizing to occur. You can se the icon of the ribbonview's application button through the ApplicationButtonImageSource property, which is of type ImageSource. The header displayed at the title bar of RadRibbonView is constructed by its Title and ApplicationName properties with a dash separator between them. You can take a peek at the Visual Structure article to see how it looks. You can also see the Change Title and Hide the Title help articles. The backstage menu is equivalent to the File menu of the traditional menu UIs. It is represented by the rectangular button (the application button) in the upper-left corner of the RadRibbonView control. The backstage menu appears when a user clicks the application button. 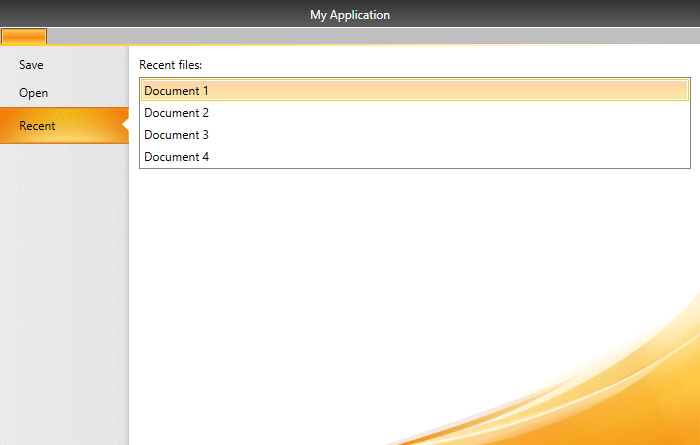 This menu can be used to display controls used to perform actions on the entire document like save, print and send. To declare a backstage menu in RadRibbonView you can set its Backstage property to an object of type RadRibbonBackstage. You can learn more about the backstage control in the Ribbon Backstage help article. Example 9: Sample backstage definition with several child RadRibbonBackstageItems in its Items collection. The Quick Access Toolbar is used to render a set of RadRibbonView controls (commands) that are most commonly used in the application. It is rendered right above the ApplicationButton to make it easily accessible to users. To declare the Quick Access ToolBar, you need to set the QuickAccessToolBar property. For more information and a practical example you can see the Quick Access Toolbar topic. This section contains all features demonstrated in the article assembled into a single example.